August 6, 2012 – Hood River, OR – Hood Technology is displaying at Unmanned Systems North America a Flexrotor, the remarkable long-range VTOL aircraft from Aerovel, equipped with a HoodTech stabilized imaging system. HoodTech president, Andy von Flotow, notes, “Flexrotor brings a quantum jump in capability to the small-UAS sector, with its unique mix of VTOL, long-endurance, small size, and fully-automated operation both in flight and on the ground. Adding our best-in-class imaging should make for a remarkably powerful combination.” The Alticam system, mounted in a nose bay forward of the aircraft’s rotor/propeller, combines a lightweight stabilized turret and onboard image processor. The system compensates for airframe motion, delivers video of exceptional acuity, and tracks targets automatically so that “hands-off” surveillance can be routinely maintained for extended periods. Performance of these stabilized imaging systems has been well-proven in recent years, with many hundreds of thousands of flight-hours accumulated in operations at sea and over land. Hood Technology Vision, Inc. (www.alticamvision.com) designs and manufactures imaging and video processing systems for aircraft, boats, land vehicles, and stationary mounts. Aerovel Corporation (www.aerovelco.com) is developing the Flexrotor unmanned aircraft for introduction to service in 2013-2014, with emphasis on economy in civil applications such as offshore reconnaissance and geological survey. Both firms are based in the Columbia River Gorge in the American northwest. Hood Technology (www.hoodtech.com - Hood River, OR), designs and manufactures stabilized EO/IR camera turrets for long-range imaging from moving platforms, such as small unmanned aircraft, manned/unmanned ground and marine systems. The company’s team of experts and vast experience in sensor integration, vibration isolation, disturbance rejection, and dedicated video processing has made HoodTech the preferred supplier of highly mass-efficient, low SWaP, small UAV ISR imaging payloads. Aerovel Corporation (www.aerovelco.com - White Salmon, WA ) develops miniature robotic aircraft from our base in Washington State's Columbia Gorge. We are small, focused, and experienced, staffed by veterans of developing the Aerosonde and Scaneagle aircraft series. 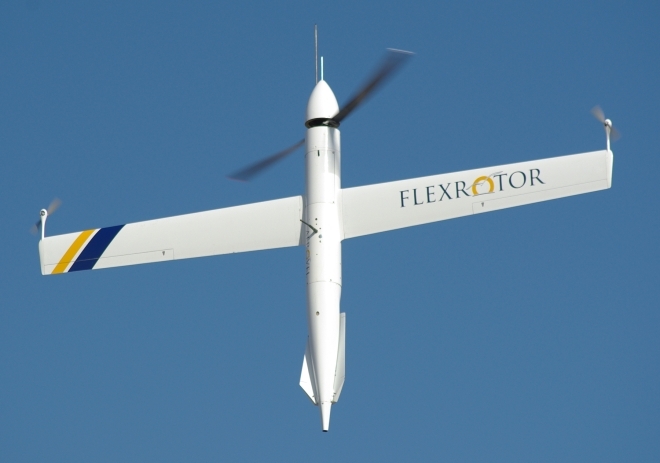 Flexrotor, a next-generation robotic aircraft is ideal for applications such as weather monitoring, geological survey, and imaging reconnaissance. Flexrotor is designed to hover for launch and retrieval, and to cruise in wing-borne flight, with unprecedented range and endurance for an aircraft of tabletop size.